Minority Language Promotion, Protection and Regulation blends a discussion of the role of official language strategies with an analysis as to how both strategies and legislation are implemented in a variety of contexts ranging from Catalonia, The Basque Country, Finland, Ireland and Wales to Canada at both federal and provincial level. It is an authoritative guide and reference volume which tracks recent influences on official language strategy from a legislative, political, social and economic perspective. 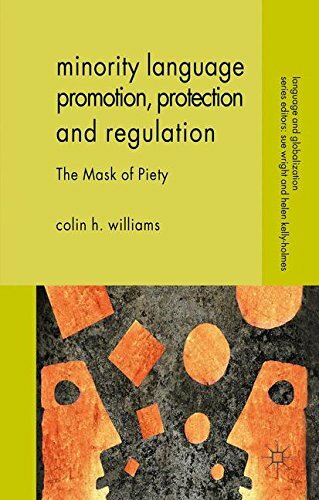 As both activist and critic, Colin Williams provides a fresh and challenging interpretation of the manner in which formally discriminated language minorities are now grappling with the exercise of power and responsibility for language –related developments within education, the media, local government and the community. The author poses difficult questions for the wielders of power and decision-makers whose official pronouncements invariably support linguistic diversity but whose policy priorities and fiscal approach tends to undercut the capacity of vibrant communities and civil servants to deliver ambitious programmes of reform in support of minority languages.